I was back at the Kettle Valley Railway, Myra Canyon trail yesterday for yet another enticing ride. There is no end to the summer here in BC so we are getting out there while we can. All photos are capture with my Fujifilm X-Pro1 or Canon 5D Mark III and the feature photos with the iPhone 4S using iOS6 and the new panorama feature. 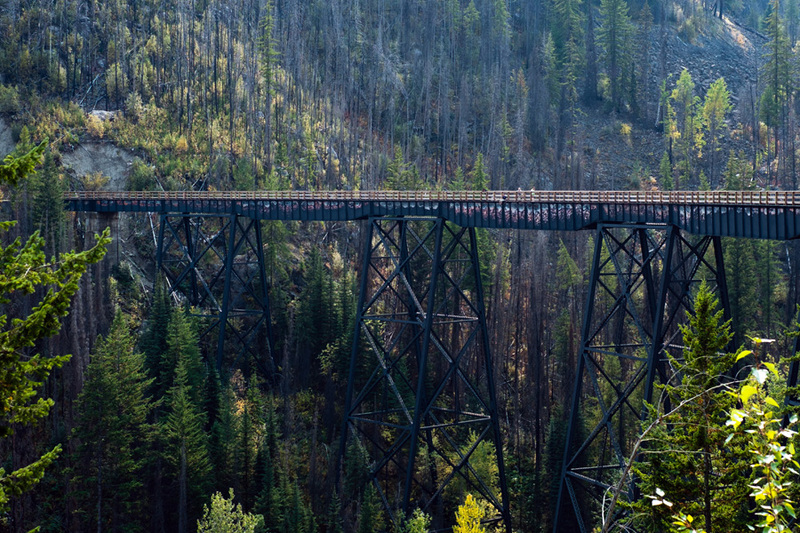 The Myra Canyon section of the Kettle Valley Railway was built between 1912 and 1914. It was part of a "Coast to Kootenay" railway line that linked Midway, in British Columbia's Boundary District, with the Canadian Pacific Railway main line at Hope. The railway carried freight and passengers through the Myra Canyon until passenger service ended in 1964 and the last scheduled train went through in 1973. See the Myra Canyon History for a little more information on the Kettle Valley Railway. In June 1973 the Kettle Valley Railway section in the Myra Canyon, with its wood-frame trestles, tunnels, rock cuts, and awe-inspiring mountainous terrain, was used by the Canadian Broadcasting Corporation (CBC) as a location for filming a segment of Pierre Berton's "National Dream" television film on the construction of the CPR through the mountains of British Columbia. The province purchased the rail corridor from Canadian Pacific Railway in 1990. 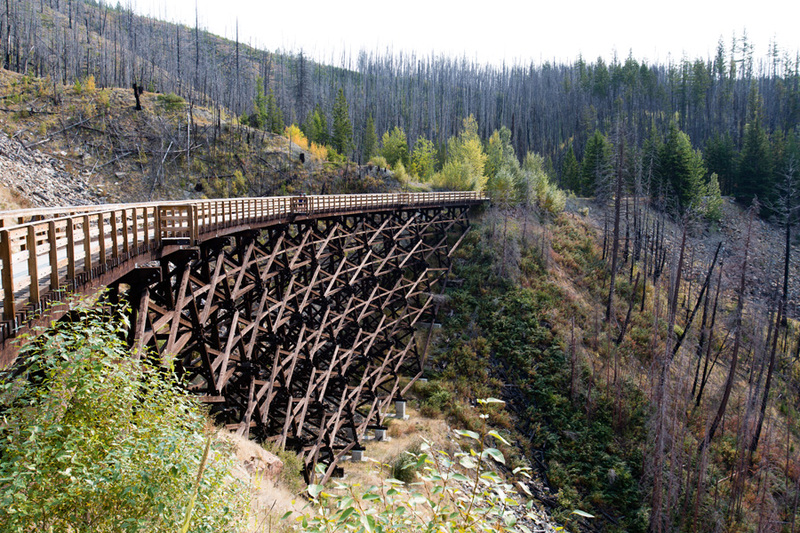 The Myra Canyon Trestle Restoration Society, established in 1992, has been instrumental in leading the restoration and maintenance of the corridor and trestles. Hundreds of volunteers have worked to cover the open trestle ties and timbers with boardwalks and to install railings to make the route safe and accessible for all ages and abilities. As a result, the trestles became a cornerstone of the Provincial Rails to Trails network, a vital link along the Trans Canada Trail, as well as a significant tourism asset attracting as many as 50,000 visitors a year. In January 2003, the Myra Canyon section (from Mile 84.5 to Mile 90.5) of the Kettle Valley Railway was designated a National Historic Site. At 2 A.M. on Saturday morning, August 16, 2003, a bolt of lightning struck a tree near Squally Point in Okanagan Mountain Park. An extremely dry summer and plenty of fuel, coupled with high winds, quickly spread the fire into the city of Kelowna. It destroyed over 200 homes before spreading up the mountainside to the former kettle Valley Railway right-of-way. 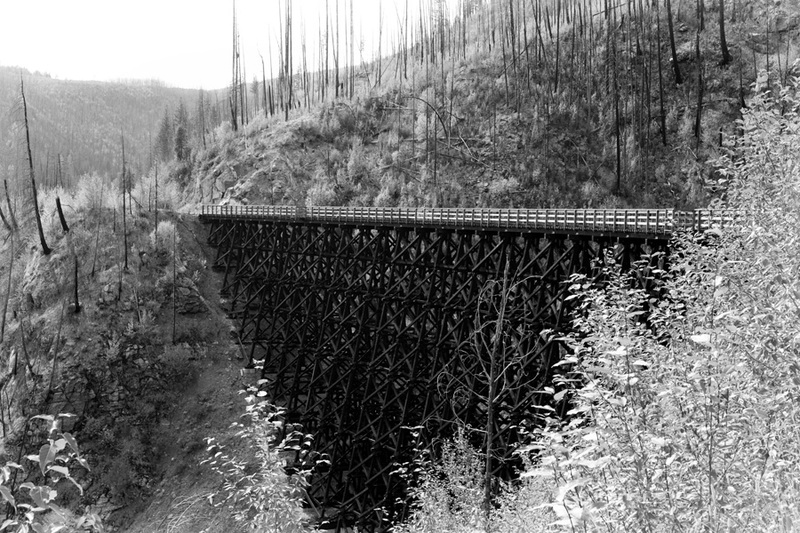 On September 3, the Okanagan Mountain Park wildfire entered the Myra Canyon area and, despite heroic efforts by firefighters, destroyed 12 wooden trestles and damaged two steel trestles.